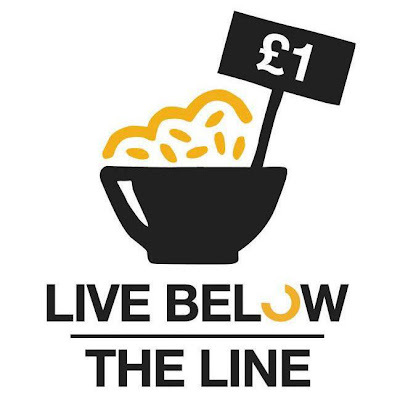 The end of Day 3 means that I'm over halfway through the Live Below the Line challenge. I've been keeping an eye on the campaign's Facebook page and Twitter feed today, mainly to get inspiration and motivation to keep going, and I know that I'm certainly not the only one of the 5000 participants who will be glad to see the back of Day 3. Even though I don't feel as hungry as I did on Days 1 and 2, I've started to focus on food and drink in a really weird way. This morning I couldn't stop thinking about pineapple upside down cake after hearing a reference to it on the TV whilst I was getting ready for work. I don't even like pineapple upside down cake. I was running a bit late and experienced utter panic at the thought of not being able to toast my allocation of bread for breakfast and prepare my bulgur wheat lunch. It was a bizarre feeling, as I didn't actually have any physical symptoms of hunger but my body was clearly in need of feeding. 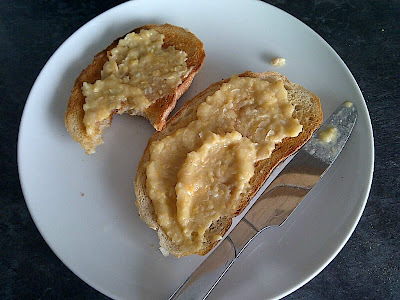 I managed to have my usual toast and chickpea and garlic spread for breakfast, this time with a squeeze of lemon juice which really woke my palate up, and felt full after the first slice. I forced myself to eat the second one because I knew how important it was to keep my strength up and avoid snack cravings later, but I couldn't help thinking that it is usually a regular habit of mine to be in a rush / too busy / get bored and chuck that second slice of toast in the bin. What a waste. Total cost of breakfast: 14p. I didn't start to feel hungry until after 11am today, which was a huge improvement on yesterday and made me feel more positive about getting through the rest of the day without flagging too much. I continued to drink lots of water and I was amazed at what a difference a slice of lemon in my hot water made. I considered it a massive treat and my only luxury of the week. 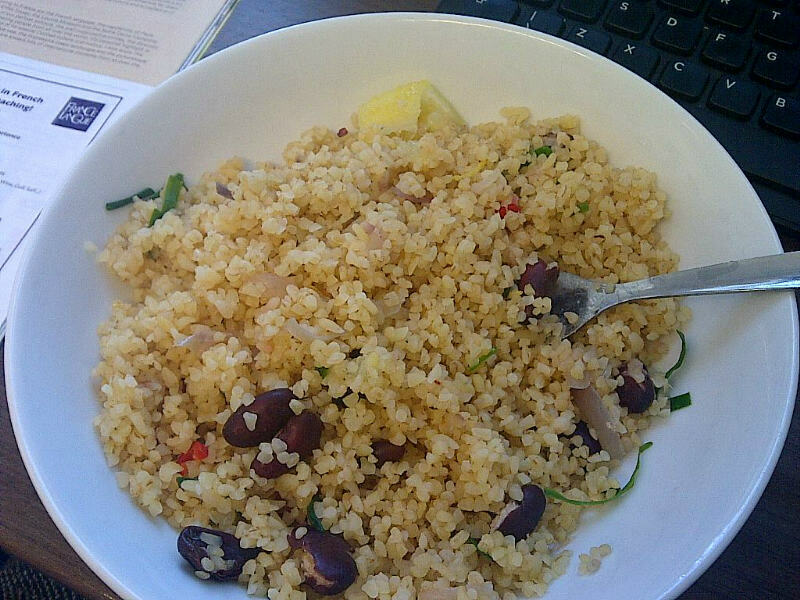 Lunch was the usual bulgur wheat portion, mixed with kidney beans, red onion, garlic and chickpeas, to which I added some strips of lemon zest, some tiny pieces of red chilli, a few chives from the garden, and a squeeze of lemon juice. I was fairly satisfied after lunch but made the mistake of chatting to some colleagues an hour later in the kitchen whilst they all ate their lunches. I felt like I couldn't stop staring at their food and it was really off-putting. They promised to sponsor me, though, so I'm glad I braved a bit of socialising at lunchtime rather than staying at my desk sipping water! Total cost of lunch: 24p. The afternoon was again the hardest part of the day. Now that I'm getting used to eating less and denying my body the usual calories and treats, I've found I'm able to look at photos of food on Twitter etc and talk about restaurants I've been to recently without feeling like I'm going to start gnawing at my own arm. I'm still incredibly hungry for the whole afternoon and glasses of water just about keep the stomach rumbling at bay. I'm also getting worried that I'll start to need snacks soon and I haven't really got anything in my stash to spare. After a trip into town straight after work I felt exhausted and couldn't be bothered to jazz up my dinner further than adding a squeeze of lemon juice and a garnish of red chilli, so lentil soup it was. I've run out of chickpeas now and was a bit disappointed that the soup was so bland. I'm saving the rest of my bread for breakfast and emergency snacking so I had a tiny, thin end piece of bread dipped into my homemade chickpea and garlic dip with dinner. I'm feeling hungry again already. Total cost of dinner: 29p. Day 3 thoughts: The overwhelming discovery today is that I'm probably only managing this so well because I can see the light at the end of the tunnel and that makes me really feel for all those in poverty who are forced to accept this as a way of life. When I say managing this, I mean I'm not spending any time thinking what I'm missing or what I could be eating and drinking. I'm not missing the finer things in life, or expensive items like meat, or even a morning coffee or glass of wine with dinner; I'm missing the normality (to me) of having access to enough food, without worrying about how I'm going to get through the day / week. That's the luxury. Total cost, Day 3: 80p. I've still got 18p to spend this week. Any tips and ideas very welcome! And please don't be afraid to suggest Asda Smart Price super noodles. I never thought I'd be going there but I'm getting very tempted.